Our first sight of land since Antarctica in the dim small hours of the 3rd of March was Campbell Island. Campbell island. Photo Anton van Helden, copyright Te Papa. 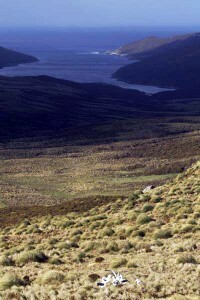 Campbell Island is home to more species of albatross than anywhere else in the New Zealand region with 6 species breeding here. The most conspicuous of these being the Southern Royal albatross that soar over head. These massive birds with a wingspang over 3.5m stand out with their briliant white plumage against the sombre tones of the landscape and the darkened sky. We spent most of an afternoon and evening up the col Lyall board walk which winds up past Beeman hill and on up to the Western Cliffs. Albatross ‘gamming’. Photo Victor Anderlini. 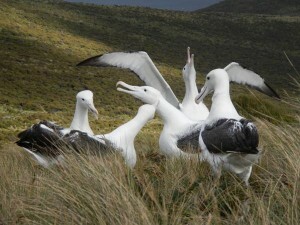 Later in the day a large number of royal albatross were congregating in small groups, a behaviour known as gamming. with displays of head shaking and wing flapping, squawking and other unusual vocal, clacking and popping sounds produced with their enormous beaks. 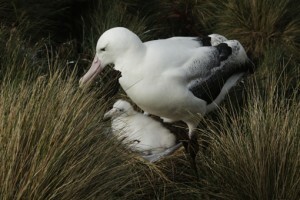 Royal albatross and chick. Photo Anton van Helden, copyright Te papa. 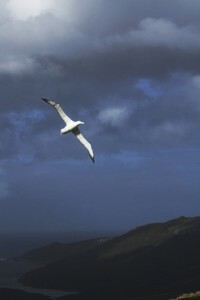 The experience of having an albatross soar low and fast right above your head is a very memorable thing, the swoosh of their wings like fighter jets. We were lucky to see some nesting birds with small chicks. This is my second time on Campbell Island, the first time was 1995 where I was stranded along with a couple of other scientists after the boat we were sailing in got caught in a storm. 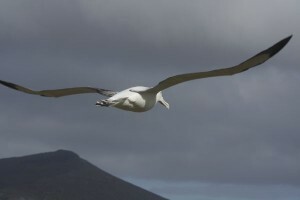 royal albatross. Photo Anton van Helden, copyright Te Papa. That was the last year that there was a manned weather station on the island. the buildings are still here and much as I remembered them, however since then the final introduced predator, the rats, have been removed. 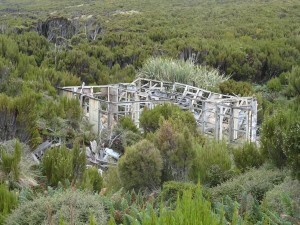 Ruins of the coastwatchers hut. was pretty much ruins, with just a few frames of walls remaining. The sealions, that last time I was here were mostly in Northwest Bay, were now using the coves and inlets of Perseverence harbour much more. 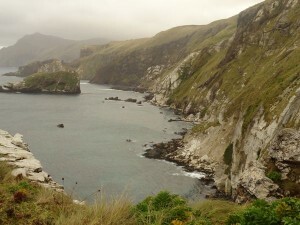 There has been a small growth of numbers on the island, in contrast to the diminishing numbers on the Auckland islands. Elephant seal. Photo Anton van Helden, copyright Te Papa. 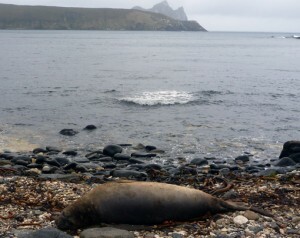 The Elephant seals have been declining in numbers, as have the Rock hopper penguins. This may be a real indicator of global warming, as it is possible that they are having to dive deeper or travel further to hunt their prey, decreasing the success rate of pups and chicks. We are now heading for the Antipodes islands, which was not part of the original plan. Because the sea ice forced our early retreat from Antarctica and the remarkably smooth seas we have had on our northward journey we have a little extra time. Entering this very productive area just off the continental shelf has already afforded us glimses of a mixed pod of long finned pilot whales and Bottlenose dolphins. the Antipodes islands are pest free apart from mice, people onboard are working to raise money for DOC to embark on a project to eradicate them, and expensive business. About $1,000,000 will be required, but the achievement of which will no doubt be a huge boon for the abundant birdlife on the island. preserve and protect, this sacrid earth in these wonderous places. Thank you Thank you. I was there 67/68 expedition with the wonderful crew and fabulous O.I.C. Reg Blezard.